The Vatican Library’s reading room. One of the world's oldest libraries in Rome faces a huge problem — how to preserve 1,800-year-old manuscripts in a digital format that's readable for next-generation computers. A format designed to store images taken by satellites and orbital telescopes such as the Hubble Space Telescope could offer a solution to the Holy See's Vatican Library. Archivists have already begun scanning the fragile, ancient tomes in the Vatican's collection with software that can transform old pages pressed against glass into an accurate, flat digital image. Such images saved in the flexible image transport system (FITS) format — designed by NASA and European space scientists in the 1970s — will allow computers built even 100 years from now to decode whatever information is stored. "If you have a tool that can read FITS today, you can read FITS files from 20 years ago," said Pedro Osuna, head of the European Space Agency's scientific archives. "It's always backwards compatible." Scanning old texts takes patience, care and high technology. The FITS open-source approach stores all instructions about how to read and process the data in a text header on top of the data. That allows FITS to be read without conversions to different formats that might become incompatible with future computers. FITS already stores astronomy data collected by space missions such as NASA's Hubble and Europe's Herschel Space Observatory. Now Giuseppe Di Persio of Italy’s National Institute for Astrophysics is helping the new effort to digitize the Roman Catholic Church's library collection. "It's very dangerous for the manuscripts every time someone touches them," said Luciano Ammenti, director of the Vatican's Information Technology Center and head of the new project. Ammenti chose FITS because of its open-source approach, its longevity over several decades and the fact that it's not owned by any one company. 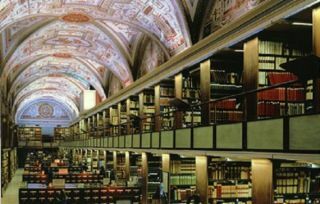 All of that may help the Vatican Library — founded in 1475 — preserve manuscripts and codices that in some cases originated before the invention of the printing press.